CULLMAN – Students at St. Bernard joined with families, faculty and staff to honor the 29 seniors of the Class of 2019 in a special Senior Dedication Mass on Wednesday, Oct. 3. Abbot Cletus Meagher provided the homily for the service and encouraged students to not only rely on the education they are receiving at St. Bernard, but also cherish the gift of faith they have received. He reminded the students, “Life is not simply about knowledge and education – it’s about the wisdom of the cross and the connection between what is learned and the knowledge of seeing the truth in God. “Being at St. Bernard means that you accept responsibility for and dedicate yourselves to the principles of the Christian faith upon which we are founded, “Abbot Cletus continued. Following the homily, the faculty and staff joined the seniors and stood with them as a sign of their support. The presence of the faculty and staff indicated their concurrence with the decision of Fr. Joel Martin, president, and Fr. Linus Klucsarits, headmaster, that the seniors should be recognized. 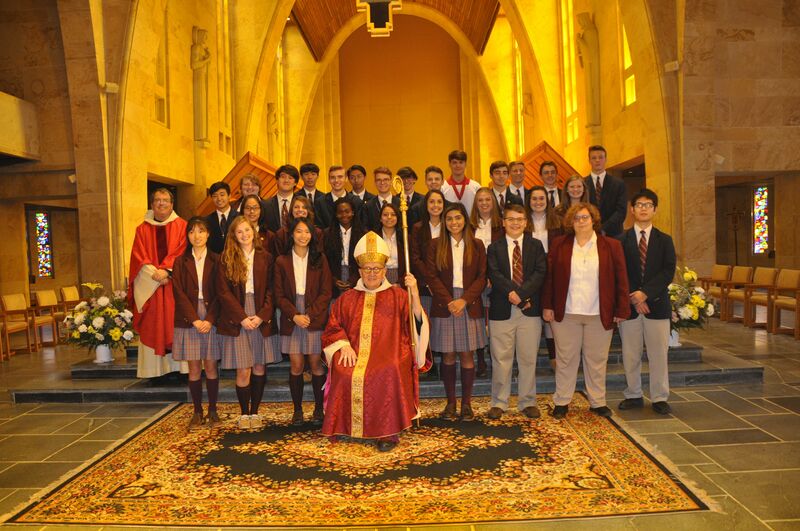 The senior class then received a blessing in recognition of the roles of leadership they have undertaken for the student body of St. Bernard Preparatory School. Ms. Jannie Ratliff was the organist for the occasion and the St. Bernard Choral Music Department provided the singing. The Knights of the Altar present were Gavin Whaley, Carson Holmes and Gin Zheng. Following the Mass, a luncheon was held in the Abbey Byre for the senior class and their families.